In Sunday’s sermon I unpacked the Lord’s M.O. in His healing of a deaf and mute man in Mark 7.31-37. It occurred to me after the fact that I could have simplified the matter with the use of a few preacherly adverbs. This I shall now do. 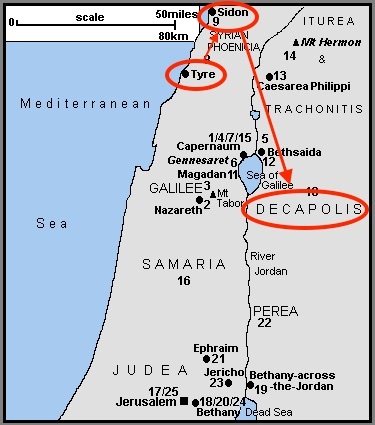 Then he returned from the region of Tyre and went through Sidon to the Sea of Galilee, in the region of the Decapolis” (Mark 7.31). “And taking [the deaf man] aside from the crowd privately…” (Mark 7.33). If it is true (and it is) that God so loved the world that he sent his only-begottten Son, it is also the case that God so loved you that he sent his Son. Jesus ministers to this man individually, even though to do so publicly before the crowds would have stirred up more publicity (though see #5 below). He cares about him as a person, not as a tally mark on His messianic scorecard. So also does the Lord, who has the hairs of your head numbered (Matthew 10.30), know and care for you. “…He put his fingers into his ears, and after spitting touched his tongue” (Mark 7.33). Yes, it’s kind of gross. And yes, it almost seems like some hocus-pocus. But the significance of Jesus’ heavenly wet-willy is to underscore the objective nature of His work. In theological terms, we say that God always works through means—tangible, physical instruments. Think water, bread and wine, words. “And looking up to heaven, he sighed” (Mark 7.34). Our English word “compassion” means literally “to suffer with” (from the Latin compati). Jesus’ compassion is constantly on view, but in a subtle way in Mark 7. The Greek word stenazo, translated in the ESV here as “sighed,” is something deeper—a kind of gut-level groan, the way a fan whose team just lost on a last-second shot groans, the way a man with two knee replacements getting up from his seat groans, the way we all groan when we find ourselves afflicted with the weight of this sad world. When our Lord plugs the deaf man’s ears, it’s as though He also plugs into the man’s suffering. And looking up to heaven, Jesus laments mankind’s brokenness and the curse wrought by sin and says, in effect, “Father, this is not the way your world is supposed to be!” As the prophet Isaiah put it, Christ is “a man of sorrows and acquainted with grief” (53.3). He not only suffers for us; He suffers with us. He is the compassionate King. “And Jesus charged them to tell no one. But the more he charged them, the more zealously they proclaimed it” (Mark 7.36). Throughout His ministry, Jesus evinces a benign indifference to popularity. That is not to say, of course, that He doesn’t “desire all people to be saved and to come to the knowledge of the truth” (1 Timothy 2.4). I’m no Calvinist. Rather, Jesus has in mind the calling and cultivation of devoted disciples. He knows full well that He can ride the miracle train all the way to kingship (see John 6.15), but that’s not His goal. He doesn’t just want more disciples; He wants deeper disciples. To be sure, part of His rationale for this gag order is that He doesn’t want to expedite His path to Calvary any more than is necessary; the quicker that word of this wonder-working would-be Messiah got out, the quicker He would earn the ire of the religious leaders, which is in fact what happened. Ultimately, though, Jesus has no intention to avoid the cross. What He does want to avoid, though, are supposed “followers” who are just looking for the benefits, the cash-value of Christianity. Then as now, belonging to Christ is a sure path to becoming unpopular. So be it.